Looking for a small cheap piece of land to put a trailer on..Between carbonear and Argentina preferably..Would also consider a cheap cabin or crown land.Must be private...thanks for looking..Just email me if u have anything.. Remote cottage land on south side Grand Lake access through Howley. Beautiful water front. Land includes; recent survey with approximately 100ft ×100ft of land cleared as well as a fifth wheel travel trailer. For more details and price call or text Steve at 486-5274. 0.228 Ha of land for sale. Just 15 minutes drive from St John's, close to East Coast Trails, 5 minutes walk from Shoe Cove beach, and only 10 minutes drive from Marine Drive Park. Great for cabin or parking your trailer during summer season. Trailor and land for sale!!! Land for sale - RARE FIND in Southlands! Build your dream home on this large cleared lot (61 x 117 ft) in Southlands. Room for a nice sized home with ample parking for RV, trailer, boat, etc. This lot is nestled between two beautifully built homes, has southern exposure, and backs onto a greenbelt. You can pick your own contractor or contract the build yourself! This is last lot in this area! Two different sets of bungalow house plans included in sale. Looking for a great deal on a larger size camper trailer in good condition to leave on my land and live in while I am building my home around the bay. Must be ready to use with no leaks and a shower. Looking for a good cash deal as it will only used for this project and overflow once home built. If you think you have what I am looking for please email me pics of the inside and outside of trailer, along with details and hopefully we can make a great cash deal. West Lake Trailer tire. Size ST225/75R 15. 1 Utility trailer... has closed-in box & door, with window built on one side, measuring 4feet wide x 7feet 4 1/2inches long x 4feet 1inch high. -- bought for carrying quad, but not quite large enough / can be used as a little cabin/trailer. - asking $400 neg. LAND!!! 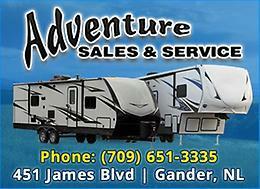 Sick of yearly campground lot fees? Electricity and water!!!!! Sick of yearly lot fees? Tired of being told what you can and cannot do while at you're trailer? Well for only $6,000 you can have your own little slice of heaven. Electricity and water available!!! Basically 3 years rent at a campground, and then you could always sell and get all your money back! We are selling fantastic 30 x 50 trailer/camping lots. These lots are a short walk away from a beautiful swimming pond and a stones throw away from the railway bed for you ATV users. Located on the Goulds Ridge Road, just minutes away from Brigus and Bay Roberts. For more info please call Jim at 787-0333. Bicycle trailer that can take two children. Includes a rain cover and extra wheels and handrail so it can be used as a stroller! In perfect condition, all straps, clamps, tires, cover, handles, etc. in good working order.